We built a boat using plans found on the web. I believe the design was from a 1950's article. Being my first time, we were very proud of the way it looked. But looking at it now, I noticed major problems. I had built the inner deck too close to the sides of the hull, and the shifting to force the boat onto the trailer for the first time, caused the sides to split. Also the plywood was not sealed proberly and now is starting to separate. Not good when the bottom of the boat comes apart. The only time the boat was ever afloat, was when it was used as a float in the 2011 Christmas parade. I probably did my boat backwards, building the boat and then trying to find a trailer to fit it. Now I have the trailer and I am going to redesign the boat to fit. This is going to be nice and hopefully easier to build. I am going to increase the size to fit on the trailer, which will also increase the water displacement. The original design displaced about 3,000 lbs, and the new design will displace about 6000 lbs. 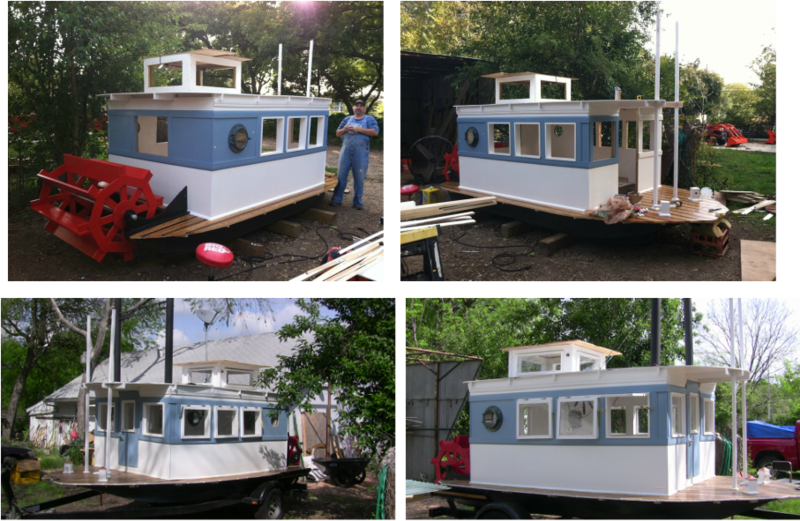 It looks like I am doubling the size of my boat, but i'm actually only adding 8 inches in hieght, and 2 feet in length. I believe the main reason of the doubling increase, was the change in hieght. I actually mean the hieght of the hull, which was originaly 10 inches. Subract 2 inches for the difference of the top of the rudder tube to the top of the hull, you can't have the water line above the rudder tube top, or you will in essence have a hole in the bottom of you boat. So that leaves you with 8 inch draft, so adding 8 inches more is in essence doubling the draft, plus the adding of 2 feet to the boats hull length, which was origanly only 15 feet. A few pictures during the build. 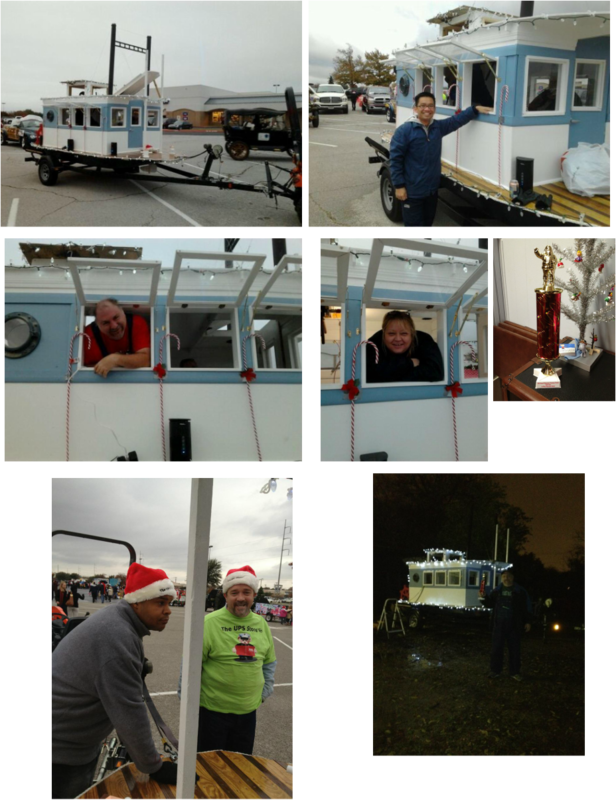 Here a few photos of the Boat in the 2011 Richardson, Texas Christmas Parade. It even won a trophy, 1st Place Adult Open Decorated vehicles.